I have just read your story about your Scottish escapade at the Castle McEwen, and it brought a smile to my face. 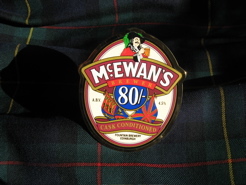 I am a Scot and a McEwan to boot (Yet another spelling) :-). I well remember the trek involved in getting to the castle site/cairn. The rickety bridge has now seen better days; consequently there is now more leaping of burns involved to get there. Having said that, I did enjoy the walk not to mention the hospitality of the Kilfinan Hotel where we were made to feel most welcome. We also enjoyed our beer! (Well, it had our name on it!). Although I work mainly in England I do try to get back to the hills as often as I can. My eldest son and I spent a fortnight roaming around the highlands last year and took the opportunity to visit the cairn again. He is very interested in all things Scottish and is currently undertaking some familial research. Anyway, I don't want to bore you. This was just a quick note to thank you for bringing back some happy memories. I am a very proud McEwan, my Father, Grand Father and Great Grand Father are from Greenock, Scotland. “As far back as I can go, they are all named John McEwan. I have been brought up and currently live in Worcester, England. "Not my choice"!! I hope to go to the Castle myself someday. My Great Grandmother was Ann (called Anna) McEwan, same spelling, and came to America, to New York State, from Dundee when she was 18. It's exciting to discover family history as I have begun to research. And your story brought a smile to our faces in turn. We love these stories we get... happy memories for all of us!